Newport, Rhode Island has a nationally significant architectural heritage. The architectural fabric of Newport reflects more than three hundred years of significant aspects of American architectural history. From 18th-century colonial examples in the Point neighborhood, to the 19th-century Gothic Revival, Shingle Style, and Beaux-Arts “cottages” of Bellevue Avenue, Newport’s buildings demonstrate a progression of American architectural styles. 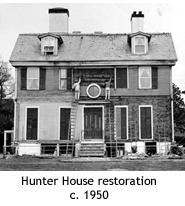 The properties maintained by the Preservation Society of Newport County help illustrate the architectural diversity of Newport, and the place of the house in American history. Hunter House (after 1748) is one of the great houses of the Georgian period, when Newport was a leading commercial seaport and a center for the arts and crafts. During the 19th and early 20th centuries, Newport’s role as a fashionable seaside resort made the town a veritable laboratory of architecture as the nation’s leading architects designed houses in a variety of styles. Kingscote (1841), an early summer cottage on Bellevue Avenue, was part of the “cottage boom,” which lasted until the 1930s. Built in the Gothic Revival style, Kingscote exemplifies the picturesque cottages that dominated American domestic architecture in the mid-19th century. The firm of McKim, Mead & White, one of the most prolific in American history, designed the Isaac Bell House (1883), a masterpiece of the Shingle Style, and Rosecliff (1902), one of the first projects in American to utilize glazed terracotta on the exterior. Architect Richard Morris Hunt, the first American to receive formal training at the École des Beaux Arts (School of Fine Arts) in Paris, built numerous houses in Newport, including Marble House (1892) and The Breakers (1895). In the mid-20th century, Newport’s outstanding architectural legacy was threatened by demolition and neglect. The Preservation Society of Newport County, along with other local organizations, and concerned citizens worked to save the city’s cultural heritage. In the years since the Preservation Society’s founding, preservation efforts have been met largely with success, although, sadly, some important buildings were lost. Learn more about the founding and early years of the Preservation Society of Newport County in Research Reports. Newport’s historic buildings provide a wealth of architectural features to explore and many visitors return to revisit their favorite sites, or to explore new details they may have missed. Each visit is bound to provide a new perspective! Following are examples of specific architectural elements that capture the special spirit of each house and property. Effect: The pediment, adapted from the classical Roman arch, draws attention to the front door,which is the focal point of a balanced, symmetrical mid-18th century Georgian house. Learn more about the architecture of Hunter House Effect: Medieval-style crenellations above the window add to the picturesque aspect of the 1840s Gothic Revival villa. Effect: The porte-cochère represents an abstract version of an ancient Egyptian columned temple with sharply incised fluted columns and round sun discs in smooth finished granite. These architectural elements reflect the Victorian fascination with ancient and exotic cultures. of Chateau-sur-Mer Effect: A focal point of the property’s formal garden, the giraffe is one of four life-sized animal topiaries designed by a Portuguese immigrant gardener in the 20th century that inspired Alice Brayton to name her country estate “Green Animals. Effect: The triple arched window, an adaptation of the Palladian windows of the Italian Renaissance, was a dominant motif of Italianate buildings of the mid-19th century. This window forms the second story of a central entrance tower; another common feature of Italianate houses of the Victorian era. Effect: A signature element of McKim, Mead & White’s Shingle Style masterpiece of 1883, the bracket is modeled after Italian Renaissance dolphins, reflecting the diverse sources of ornament that appear in the house. Effect: The portico provides a monumental entrance to what Mrs. William K. Vanderbilt referred to as her “temple to the arts.” Architect Richard Morris Hunt modeled the columns after the originals on the east façade of the Louvre, an architectural icon of the Louis XIV period. Effect: The loggia, (open porch) with a view of the countryside or water, is an essential element of the Italian Renaissance palazzos that inspired the design for The Breakers. The loggia links the central Great Hall of the house to the terrace and provides views of the sea and sky. Effect: Encouraging the viewer to walk from the main house across the grounds, this classical 18th century French style pavilion is a visual focal point of the garden. It offers the visitor views of the main house, grand allée, and the partly concealed sunken garden. Effect: The classical arch with garlands of flowers and musical instruments captures the spirit of the house, which was inspired by the theme of garden entertainments.